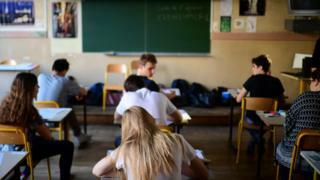 French BFMTV news says the devices will enable teachers to check quickly if all pupils are present, instead of each class having to go through the register orally - a time-consuming tradition. The school's new rule says the devices will also help teachers to check pupils' presence for sports, library sessions, emergency drills and school outings. The new rule was introduced without consulting parents, according to reports. The school will fine a pupil €10 (£9; $12) if he or she loses the fob or forgets to carry it.